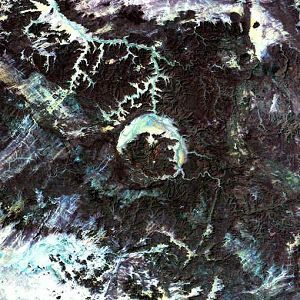 Gweni-Fada is a complex crater located in northern Chad. It was first recognized through the study of aerial photos, and its impact origin was later confirmed by a scientific expedition. 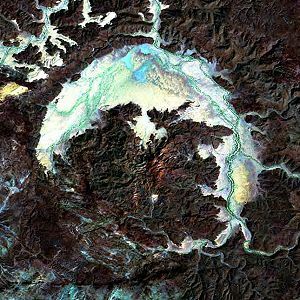 The crater is 14km in diameter, and has a pronounced central uplift structure. The target rocks are Devonian sandstones. The outer rim is poorly defined in some places, and is made up of dipping sandstone blocks. The annular trough between the rim and the central uplift has an irregular crescent shape, a diameter of 12km, and a maximum width of 4km in the north. The central uplift structure has a diameter of 10km, and is made up of several blocks of sandstone. Its topography is rugged, and includes summits higher than the outer rim. Gweni-Fada has a very small amount of impact deposits. No impact melt bodies or impact breccias have been observed. Monomict breccias were noticed in dyke zones, and appeared to be cataclasites. There is a possibility that impactites exist and are buried under more recent deposits, but drilling projects would be required to establish this. Despite the lack of impact deposits, evidence of shock metamorphism has been found at Gweni-Fada. Researchers have examined rock samples from the central uplift structure, and quartz grains from these rocks contain up to four sets of planar deformation features in one grain. The characteristics of Gweni-Fada have raised some interesting questions about how impact craters form. In particular, the lack of impactites and the large size of the central uplift structure are considered unusual. These features have led some researchers to speculate that these features occurred because Gweni-Fada may have impacted into a water-laden sandstone body. 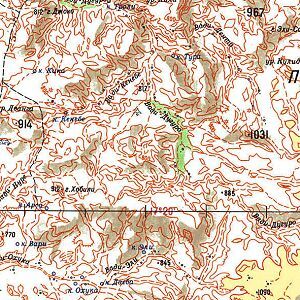 The sandstones present in this part of Chad are excellent aquifers now, despite the desert climate. If the impact occurred into a water-rich rock, the material ejected from the crater could have been in the form of fluidized flows, instead of impactites. This would explain why there are no impactites there now. In addition, craters on Mars with abnormally large central structures show evidence of forming in a water-rich layer or target rock. While this explanation for the features at Gweni-Fada is intriguing, the possibility remains that the crater is simple abnormal, and that the impactites have eroded. Since the age can only be constrained to earlier than the Devonian, complete impactite erosion is a possibility. (Vincent Pierre M., Beauvilain Alain "Gweni-Fada (Ennedi, Sahara du Tchad)", 1996). лПМШГЕЧБС УФТХЛФХТБ зХЬОЙ-жБДБ ТБУРПМПЦЕОБ Ч У.-Ч. ЮБУФЙ тЕУРХВМЙЛЙ юБД, ~ Ч 30 ЛН У.-Ч. З. жБДБ. нЙОЙН. ДЙБНЕФТ УФТХЛФХТЩ, ЧЩТБВПФБООПК Ч РЕУЮБОЙЛБИ ЧЕТИОЕЗП ДЕЧПОБ, ДПУФЙЗБЕФ 14 ЛН; ЬФБ УФТХЛФХТБ СЧМСЕФУС ЮЕФЧЕТФПК РП ТБЪНЕТХ БУФТПВМЕНПК, ЙЪЧЕУФОПК Ч ОБУФПСЭЕЕ ЧТЕНС Ч бЖТЙЛЕ. иБТБЛФЕТОПК ЮЕТФПК УФТХЛФХТЩ СЧМСЕФУС ЕЕ БУЙННЕФТЙЮОПЕ УФТПЕОЙЕ Й ОБМЙЮЙЕ ЛТХРОПЗП ГЕОФТ. РПДОСФЙС. пЛТХЦБАЭБС БУФТПВМЕНХ ДЕРТЕУУЙС ЙНЕЕФ ЖПТНХ РПМХНЕУСГБ, ЧЩФСОХФПЗП Ч НЕТЙДЙПОБМШОПН ОБРТБЧМЕОЙЙ Й ПФЛТЩФПЗП ОБ ч. ч ГЕОФТ. ЪПОЕ УФТХЛФХТЩ ТБУРПМБЗБЕФУС РПДОСФЙЕ, ЧПЪЧЩЫБАЭЕЕУС ОБД ПЛТХЦБАЭЙН БУФТПВМЕНХ ЧБМПН. ч РПТПДБИ, ЧНЕЭБАЭЙИ БУФТПВМЕНХ, ЧЩСЧМЕОЩ УМЕДЩ ХДБТОПЗП НЕФБНПТЖЙЪНБ. (Vincent Pierre M., Beauvilain Alain, 1996).